The former leader of the Party of Regions faction, Oleksandr Yefremov, is suspected of helping in the formation and activities of the terrorist organization Luhansk People's Republic, Prosecutor General of Ukraine Yuriy Lutsenko has said. "A week ago we received direct testimony about the involvement of Mr. Yefremov in establishing the LPR. Mr. Yefremov is suspected of misappropriating property of Luhanskvuhillia, taking deliberate actions to change the borders of Ukraine, violation of the Constitution, which led to the loss of life, and helping in organizing and providing other assistance in the establishment and activities of the terrorist organization LPR," the prosecutor general said at a press briefing in Kyiv on Saturday. 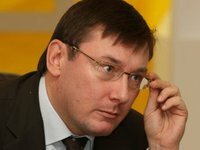 Lutsenko also said that a former member of the Party of Regions, lawmaker of the fourth and fifth convocations, Volodymyr Landik, is not the only one who testified against Yefremov. According to the prosecutor general of Ukraine, Yefremov is suspected of having committed a number of criminal offenses - misappropriation of property (Part 5 of Article 191 of the Criminal Code), committing deliberate actions to change the boundaries of the territory of Ukraine in violation of the Constitution, which led to the deaths and other severe consequences (Part 3 of Article 110 of the Criminal Code), in organizing the terrorist organization LPR and providing other assistance in its activities (Part 1 of Article 258-3 of the Criminal Code). As reported, Yefremov was detained on suspicion of violation of the territorial integrity of Ukraine. He was detained at the Boryspil airport with a ticket to Vienna on Saturday morning. Article 110 of the Criminal Code of Ukraine "Encroachment on the territorial integrity and inviolability of Ukraine" envisages life imprisonment if these actions resulted in deaths or other serious consequences. On November 21, 2015, the Prosecutor General's Office of Ukraine (PGO) sent materials regarding the indictment of former Party of Regions MPs Oleksandr Yefremov and Oleksandr Stoyan, and Serhiy Hordiyenko of the Communist Party, to a court over their voting for the "dictatorship laws" on January 16, 2014. The former MPs are suspected under Part 2 of Article 364 (abuse of power or office), and Part 2 of Article 366 (forgery by an official) of Criminal Code of Ukraine. On November 30, 2015, the Pechersky District Court returned to the prosecutor's office the indictment against Yefremov, Stoyan and Hordiyenko in the case of voting for the "dictatorial laws" on January 16, 2014. The relevant decision was made by a panel of three judges, who said that the indictment did not meet the requirements of the Criminal Procedure Code of Ukraine. In May 2016, Yefremov said that he was questioned in six criminal cases against him, but he doesn't know the exact number of cases. The same month, former MP of the Party of Regions Volodymyr Landik said that he would show the Prosecutor General's Office evidence that the election results in Luhansk region were falsified, as well as other evidence of offences committed by Yefremov.